Josef “Sepp” Wurmheller was born on 4 May 1917 at Hausham in Oberbayern. He was an accomplished glider and powered aircraft pilot pre-war. He began his training as a fighter pilot in the Luftwaffe in 1937. By summer of 1938, Gefreiter Wurmheller was serving with 2./JG 334. At the outbreak of World War 2, Unteroffizier Wurmheller was serving with 2./JG 53. He recorded his first victory, a RAF Fairey Battle single-engined bomber near Saarbrücken, on 30 September 1939. From November 1939 to June 1940, Wurmheller undertook instructing duties. In June 1940, Wurmheller returned to JG 53 and combat duty. Feldwebel Wurmheller was assigned to 5./JG 53. He participated in the Battle of Britain surviving two ditchings in the English Channel. His dousing in the Channel of 23 November in Bf 109 E-4 (W.Nr. 5212) following aerial combat over England resulted in hospitalisation until March 1941. On 7 May 1941, he gained his 9th and 10th victories when he downed two RAF Spitfire fighters. He spent a short period on the Eastern Front where he added nine victories to his tally. Oberfeldwebel Wurmheller was transferred back to the Channel front to serve with the Stabsstaffel of II./JG 2 in July 1941. In less than four weeks, Wurmheller claimed 13 Spitfires. On 4 September, Oberfeldwebel Wurmheller was awarded the Ritterkreuz for 31 victories. A further spell of instructing followed before a return to combat duty in May 1942. Assigned to 1./JG 2, Wurmheller gained 10 victories during May 1942. In June he claimed another 11 victories. His most successful day came during the Allied landings at Dieppe on 19 August 1942. Despite a crash-landing, during which he broke a leg and suffered concussion, Wurmheller claimed seven victories during the day. The feat earned Wurmheller a promotion to the rank of Leutnant and the award of the Eichenlaub (Nr 146), presented on 20 August 1942. His score stood at 60 victories. 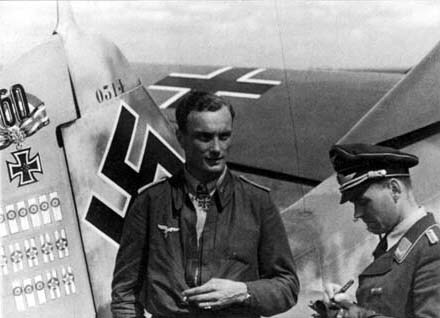 Oberleutnant Josef Wurmheller, Staffelkapitän 9./JG 2, was photographed, beside his Fw 190 A-6 (W.Nr. 530314) “Yellow 2”, in August/September 1943. 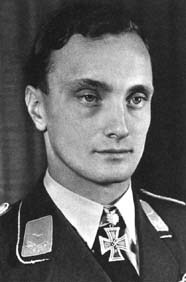 On 1 April 1943, Wurmheller was appointed Staffelkapitän of 9./JG 2. He recorded his 70th victory on 17 May, when he shot down a USAAF B-17 four-engine bomber. On 23 September, he was wounded by bomb splinters while making an emergency landing in Fw 190 A-6 (W.Nr. 530 314) “Yellow 2” during a bombing raid at Vannes-Meuçon. On 8 March 1944, he claimed his 90th victory. Hauptmann Wurmheller was appointed Gruppenkommandeur of III./JG 2 on 8 June 1944. He replaced Hauptmann Herbert Huppertz (78 victories, RK-EL) who had been shot down and killed in aerial combat. He downed two USAAF P-47 fighters near Caen on 12 June (100-101). Wurmheller killed in Fw 190 A-8 (W.Nr. 171 053) on 22 June 1944 during aerial combat with Allied fighters near Alençon when he collided with his wingman. He was posthumously awarded the Schwerten (Nr 108) and promoted to the rank of Major on 24 October. Josef “Sepp” Wurmheller achieved 102 victories. He recorded nine victories over the Eastern Front. Of the 93 victories recorded over the Western Front, at least 20 were four-engine bombers and at least 56 RAF Spitfire fighters.